Let me now proceed to the arch-paradigm of esoteric phoniness of the latter days. In the mid-fifties, Messrs. Secker & Warburg, a perfectly respectable publishing firm in Britain, sent me a manuscript for evaluation. The author’s name was Lama Lobsang Rampa, the title The Third Eye. I was suspicious before I opened the wrapper: the "third eye" smacked of Blavatskyan and post-Blavatskyan hogwash. The first two pages convinced me the writer was not a Tibetan, the next ten that he had never been either in Tibet or India, and that he knew absolutely nothing about Buddhism of any form, Tibetan or other. The cat was out of the bag very soon, when the "Lama", reflecting on some cataclysmic situation in his invented past, mused "for we know there is a God." A Buddhist makes many statements of a puzzling order at a time, and he may utter many contradictions; but this statement he will not make, unless perhaps--I am trying hard to find a possible exception --he is a nominal Nisei Buddhist in Seattle, Washington, who somehow gets into Sunday school at age eleven and doesn’t really know what he is talking about. Even if we apply a very lenient scholarly defense for the statement there are gods (lha) in Tibetan and North Indian Buddhism; by courtesy, the numerous Buddhas and Bodhisattvas of the highly diffuse Buddhist pantheon could be, and sometimes are, referred to as "gods"--the statement "there is a God" is and remains impossible for any Buddhist. I concur with his result: though the Buddha is indeed worshipped like a god in many ways, he is not seen as a god, or as God. The semantic entailment of "God" is that of creatorhood, control, power, etc., which the Buddha obviously cannot have, since he has passed into mahanirvana and is hence extinct: in fact, only Buddhas are extinct--men, gods, demons, etc., are in samsara; they, or some of them, have power, up to the power of creation like Brahma the Hindu demiurge, or the Judaeo-Christian God. 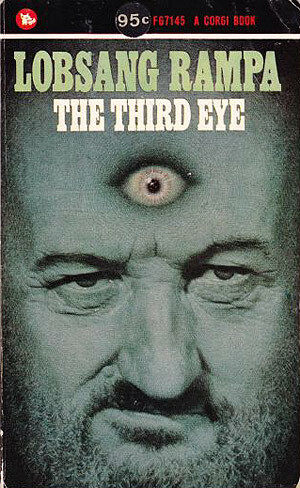 But this was only one of the inane impossibilities of The Third Eye. Every page bespeaks the utter ignorance of the author of anything that has to do with Buddhism practiced and Buddhism as a belief system in Tibet or elsewhere. But the book also shows a shrewd intuition into what millions of people want to hear. Monks and neophytes flying through the mysterious breeze on enormous kites; golden images in hidden cells, representing earlier incarnations of the man who views them; arcane surgery in the skull to open up the eye of wisdom; tales about the dangers of mystical training and initiation--in a Western world desperately seeking for the mysterious where everything is so terribly accessible to inspection, where the divine has been bowdlerized or institutionalized, where it speaks with the wagging-finger lingo of moralistic nagging, the less hardy and the softer will seek that which is the opposite of all these turn-off factors. In its extremes, this desperate quest for the impossible and the nonexistent is pathetic; at a seance of the Aquarian Foundation in Seattle, Washington few years ago, the "leader read from tablets presented to him blindfolded. During the coffee break, all but a little old lady had left the church hall. The reverend didn’t notice her and began to pack and unpack equipment in a box hidden under the table draped with a cloth. The woman came up to him and said, "Reverend K., I have seen it--but I won’t tell." I think this episode exemplifies that tragical quest for consolation even if its instrument is fraudulent.